The story of humanity’s last trip to the Moon and the gifts brought back. A familiar, beautiful sight at night. When the Moon is shining brightly in the night sky, it often stops me in my tracks. Staring up at it I can never quite get my head round the fact that twelve humans have walked on its surface, travelling more than a quarter of a million miles for the privilege. Setting foot on the Moon is one of humanity’s greatest achievements. The brave Apollo astronauts that made the journey were kind enough to bring some of the Moon back to Earth with them for us all to enjoy. 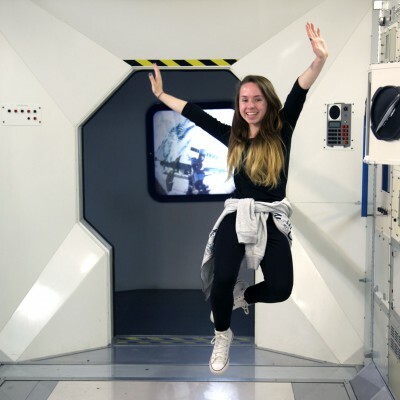 Thanks to the generosity of NASA, these samples are on exhibit around the world – including here at the National Space Centre. Our Moon Rock sample was brought back from the last visit humanity made to the Moon, all the way back in 1972. Moon rock is rare. Really rare. Rarer than diamond and gold in fact. 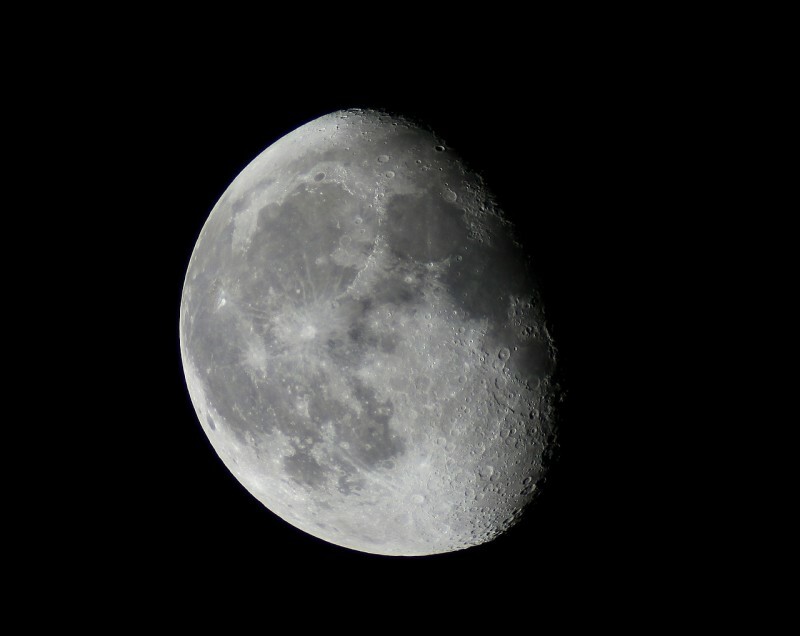 At least it’s rare here on Earth – up on the Moon you can’t move for the stuff! The point is, diamonds and gold are far easier to come by than Moon rock. 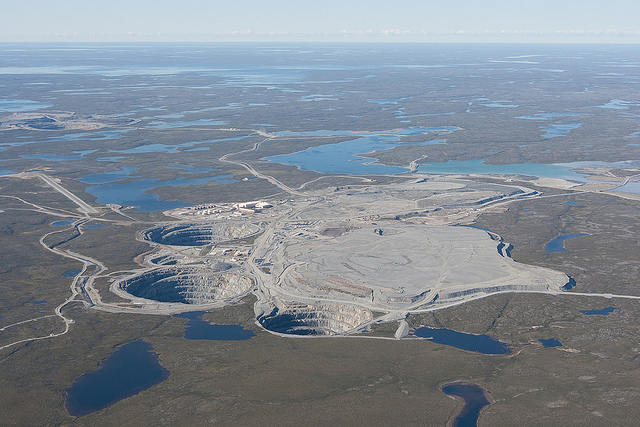 Around 26,000 kilograms of diamonds are mined every year, whilst some estimates place the amount of gold mined per year at around 3,000,000 kilograms. All of the Moon rock known about here on Earth adds up to a grand total of just over 430 kilograms – less than 0.02 percent of the total gold mined per year. Moon rock here on Earth comes from three sources: the samples brought back by NASA’s Apollo missions, samples returned by the Soviet Union’s robotic Luna spacecraft, and lunar meteorites which were blasted off the surface of the Moon and fell to Earth of their own accord (see pictures below). Apollo harvested 2,415 samples over the course of six Moon landing missions – totalling 382 kilograms of lunar material. 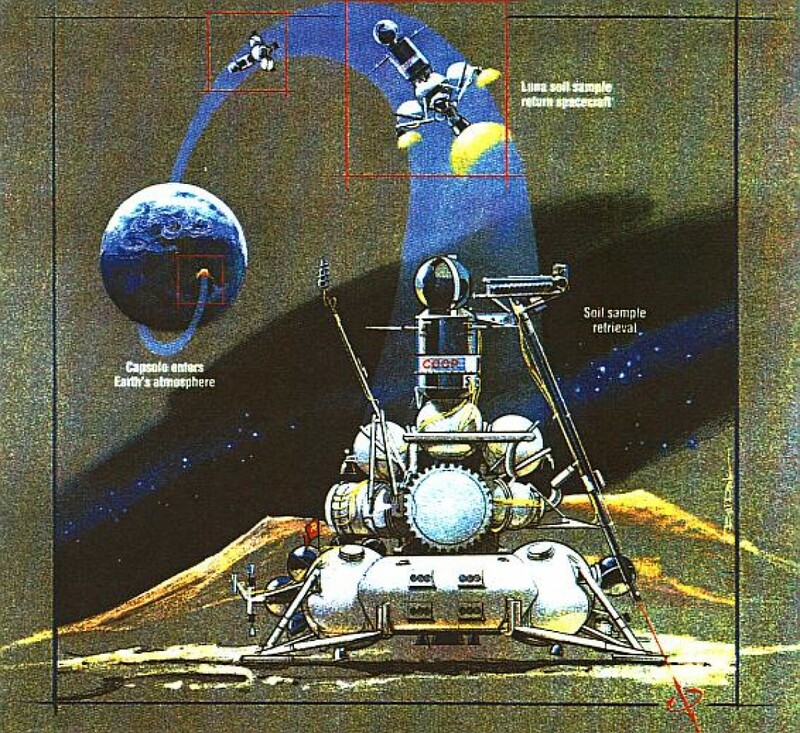 The Soviet robotic landers Luna 16, Luna 20 and Luna 24 managed only a comparatively small 326 grams. 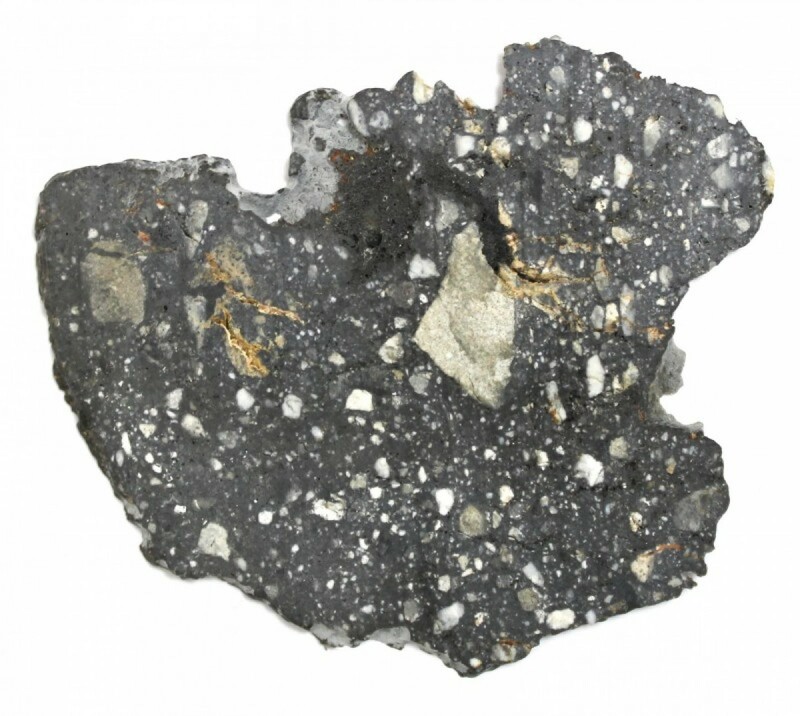 Lunar meteorites account for the remaining 48 kilograms. The total amount of Moon rock we know about is tiny compared to these precious metals and gemstones, so when you get an opportunity to see some of it up close you should jump at the chance. 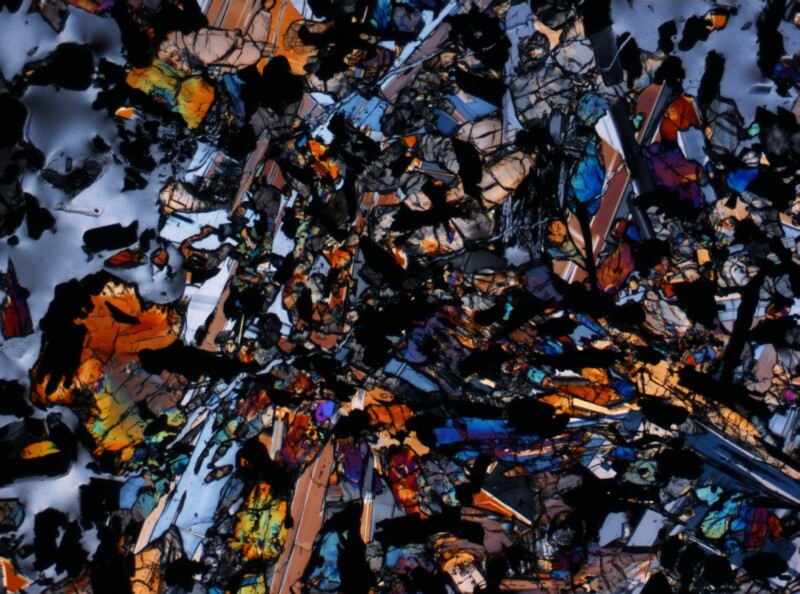 And, as you can see in this picture, Moon rock has its own beauty. Even if you aren’t impressed by its rarity or its beauty, and let’s face it beauty is in the eye of the beholder, hopefully you will still be left in awe of just how difficult it was for NASA to bring it back. I often find myself pointing out the sample on display here and simply saying ‘that’s a piece of the Moon. An actual piece of the Moon!’ – after all, what more is there to say?! 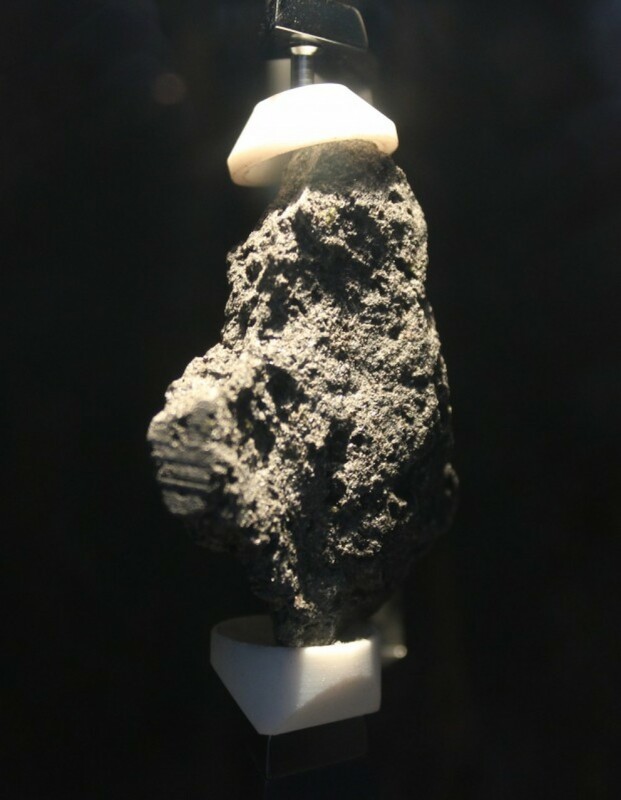 For those that still find it difficult to get enthused about geology, our Moon Rock sample is part of a bigger story of human achievement and scientific discovery. 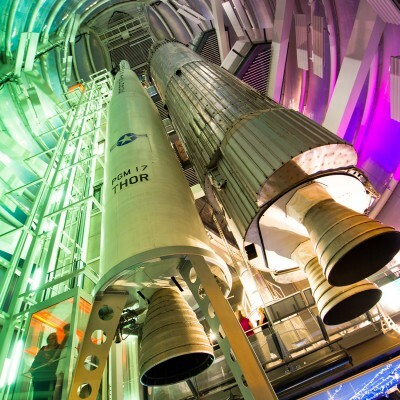 It was collected on the final Moon landing mission – Apollo 17. For three days during December 1972, astronauts Gene Cernan and Harrison ‘Jack’ Schmitt explored the surface of the Moon. 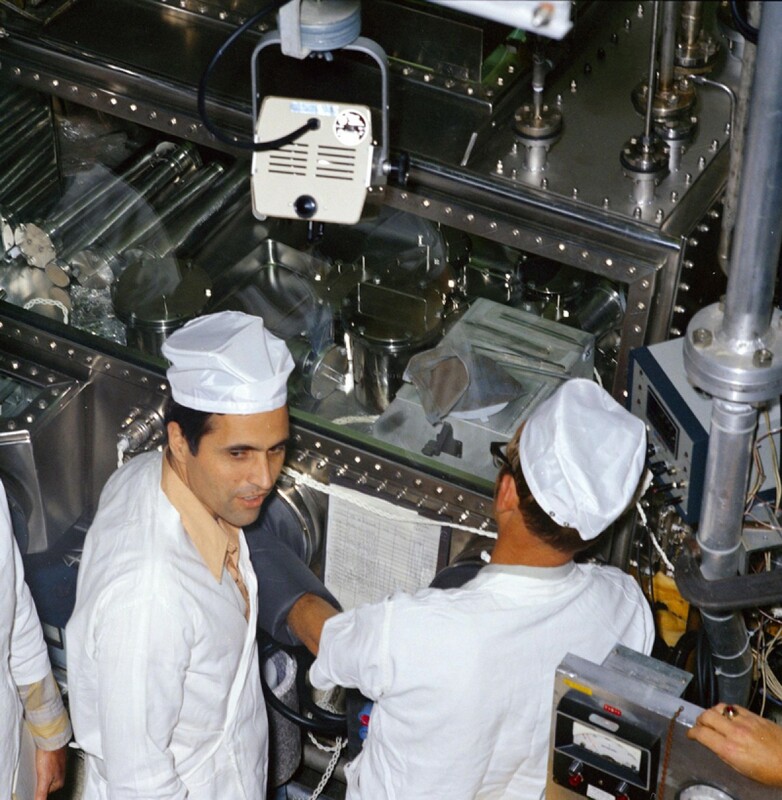 Schmitt was not originally meant to fly on the mission, but pressure from the science community saw him replace Joe Engle after Schmitt’s planned Apollo 18 mission was cancelled in 1970. The science community lobbied those at NASA to send a geologist to the Moon instead of another ‘test-pilot’ astronaut, which resulted in Schmitt replacing the unfortunate Engle. 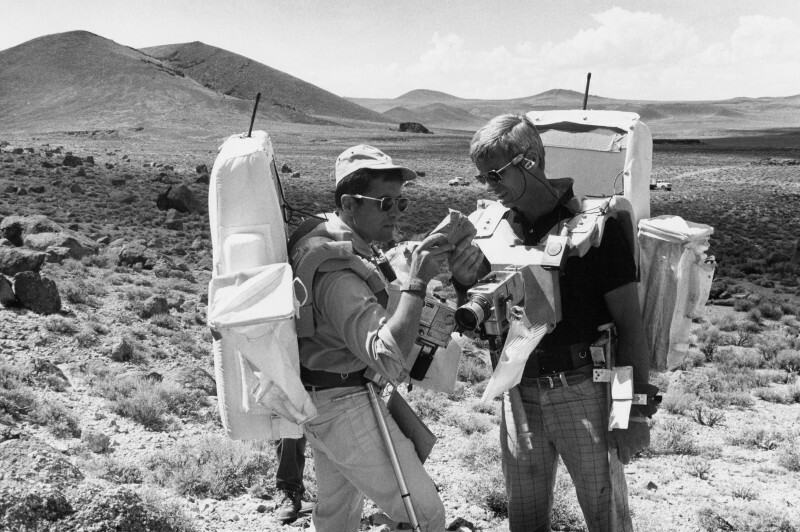 Jack Schmitt had provided much of the geology training for Apollo astronauts, but seeing the Moon’s surface for himself would offer new opportunities for scientific study. 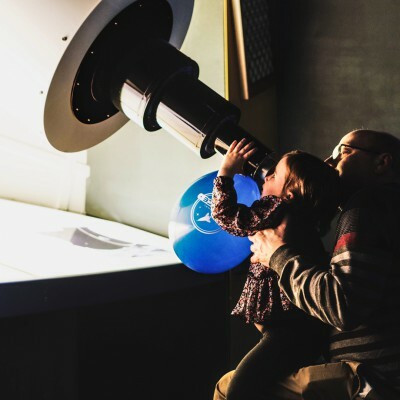 Although there were other driving factors behind America’s lunar ambitions, it’s important to remember that the Moon landings were some of the greatest science fieldtrips of all time. 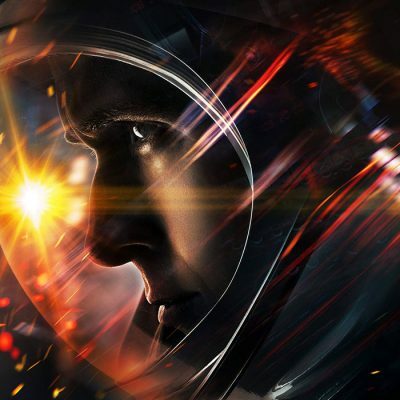 One of Apollo’s big science questions was how the Moon was formed? What was it made of? Collecting samples of rock, dust and cores drilled from beneath the surface became a bigger and bigger part of the missions as time went on. As the capacity for carrying more equipment and returning more samples increased, so did the time spent on the surface exploring. 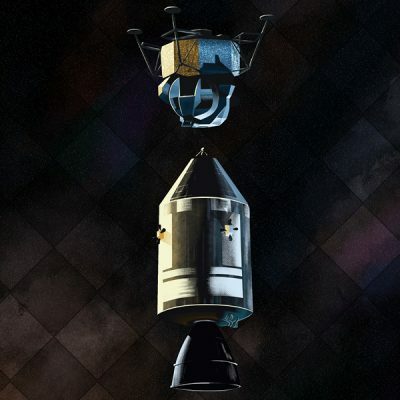 The crew of Apollo 11 had less than three hours to look around. 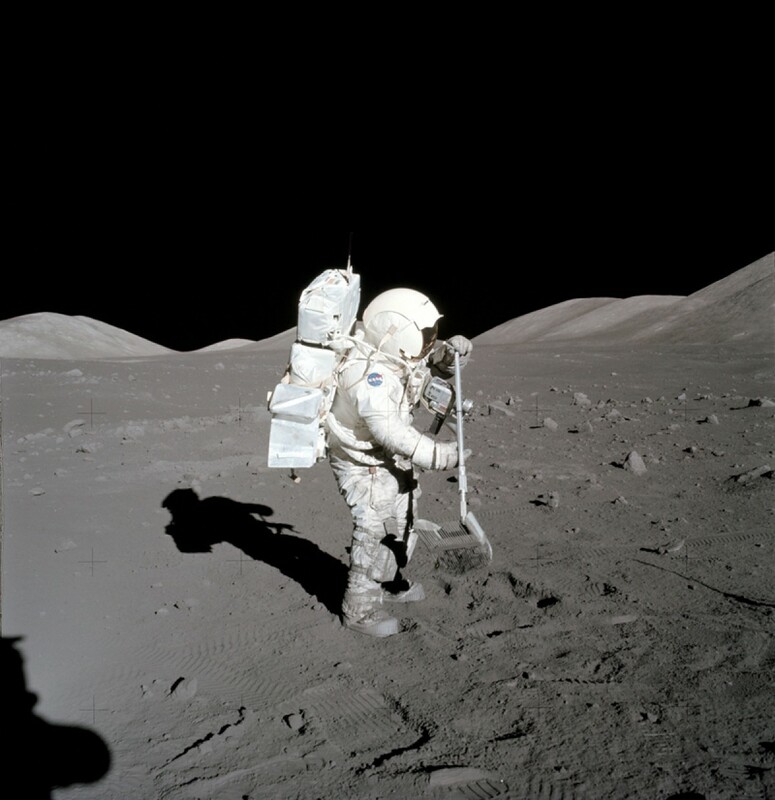 By the time of Apollo 17, the crew spent more than 22 hours carrying out experiments, exploring and collecting samples. The Lunar Rover Vehicle allowed the crew to travel distances that left them an hour’s drive away from the safety of their spacecraft. The bravery needed to do this fills me with nothing but admiration. Every sample that was collected was bagged and given a unique identification number. 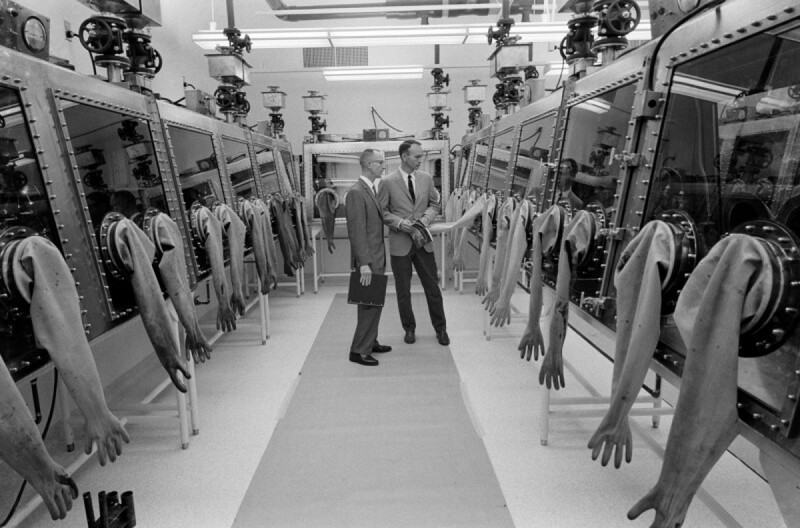 Scientists wanted the samples kept in pristine environmental conditions, so a Lunar Receiving Laboratory was set up at the Manned Spacecraft Center in Houston (now the Lyndon B. Johnson Space Center, picture below). Here the samples could be sorted and studied in inert conditions, using vacuums, nitrogen and glove boxes to prevent contamination. Many samples were broken up, allowing them to be shared with scientists all over the world for study. Other samples, like the one we have on display, were provided to institutions as part of NASA’s remit to inspire the next generation. Our Moon Rock sample comes from a bigger rock numbered 74255. 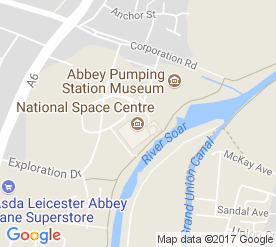 The first digit, 7, is used for any sample collected on Apollo 17, with the rest of the digits relating to exact location of discovery and size of the specimen. 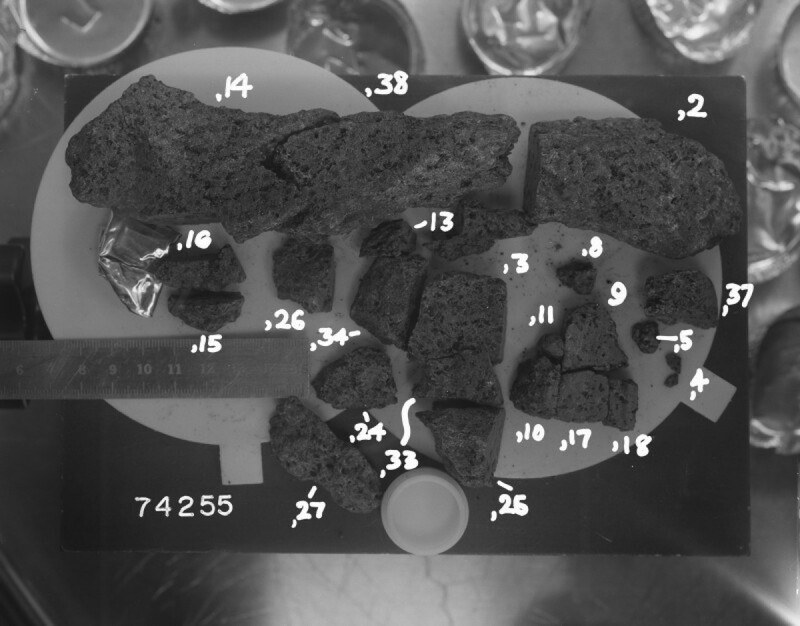 Our Moon Rock’s full numerical code is 74255,14 – the addition of the number 14 after the comma identifies it as being part 14 after the complete rock (sample 74255) was broken up for study. 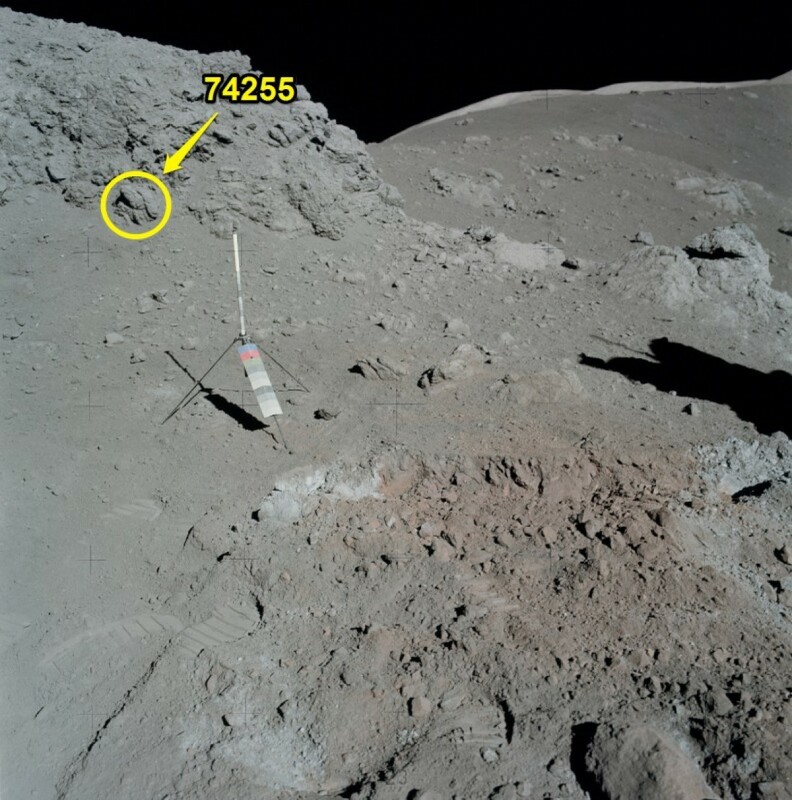 Sample 74255 was collected from a large fractured boulder on the rim of Shorty Crater. Thanks to the meticulous records kept by the crew, we can even see a picture of the rock still on the Moon before it was collected (see picture below). It was relatively easy for Jack Schmitt to collect a sample from this large fractured boulder – but collecting samples wasn’t always so straightforward. 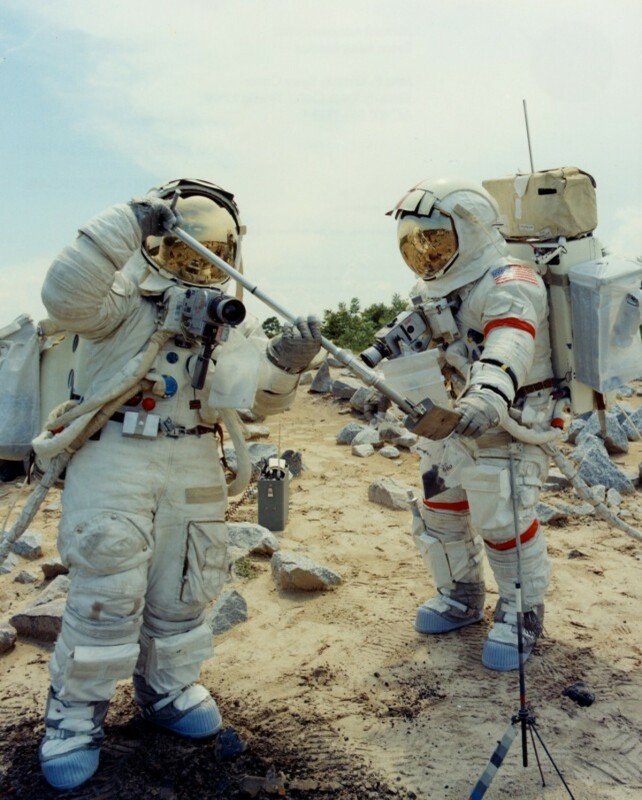 Schmitt was an expert here on Earth, but found it difficult to take samples whilst wearing a bulky spacesuit and coping with the reduced gravity of the Moon. 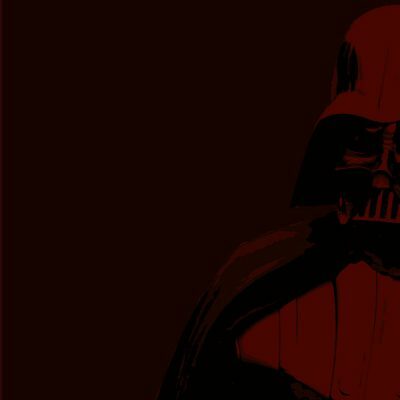 Unfortunately for him, exactly how difficult he found it was captured on film as can be seen in this clip. 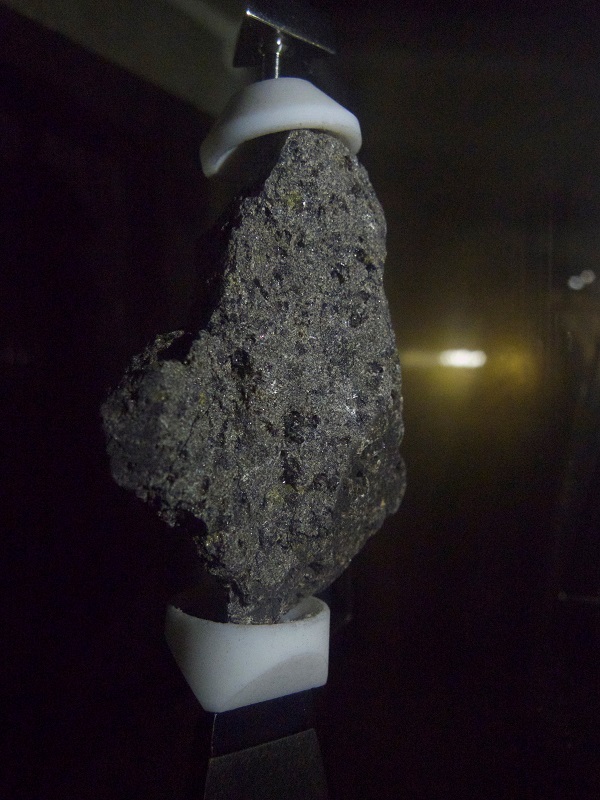 The sample on display here at the National Space Centre is a high-titanium coarse grained basalt rock, with abundant ilmenite (a titanium-iron oxide mineral). It is 3.8 million years old and shows an exposure to solar radiation age of 17 million years. This means it was formed a long time ago, but was under the surface until more recently when it was brought up and began being exposed to the Sun’s rays – ‘recently’ in geological terms that is! The fact that scientists can work out so much from one geological sample explains why collecting rocks and soil samples was such an important part of the Apollo programme. Careful study by scientists of the treasures brought back on Apollo continues to this day. 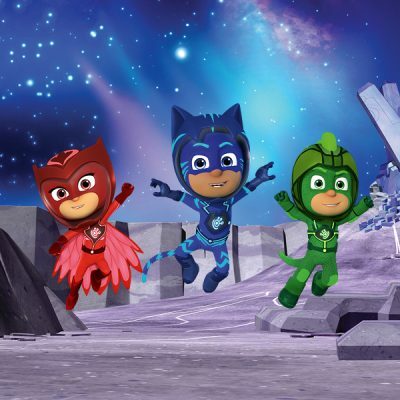 It has allowed us to better understand the early history of the Solar System and the origins of the Moon. 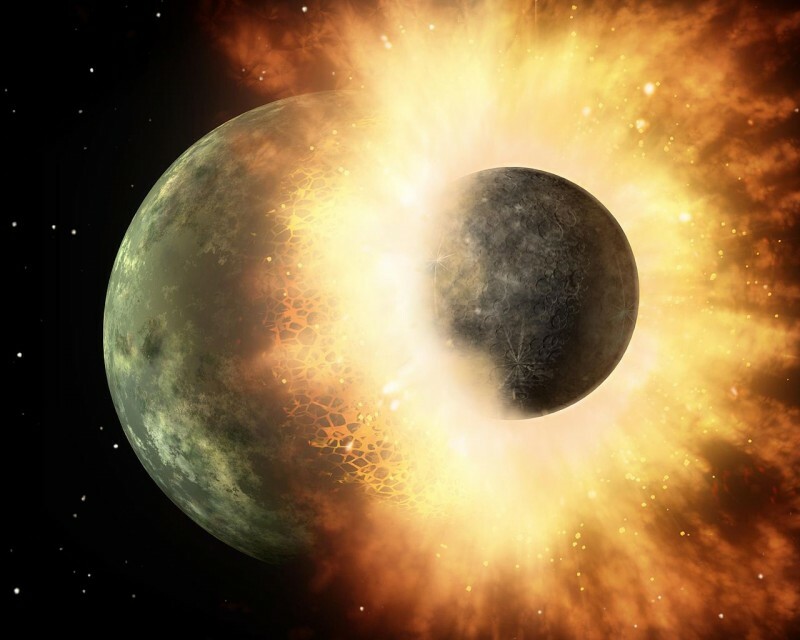 One popular theory states that the Earth was struck a glancing blow by a protoplanet the size of Mars, with debris jettisoned from the collision eventually forming into our Moon. The chemical composition of the samples the Apollo astronauts brought back to Earth has added much credibility to this idea. The samples collected tell a story of the Moon’s crust forming around 4.4 billion years ago. Since then the Moon has witnessed a period of intense meteorite bombardment, lava flows and has been exposed to the Sun’s radiation. 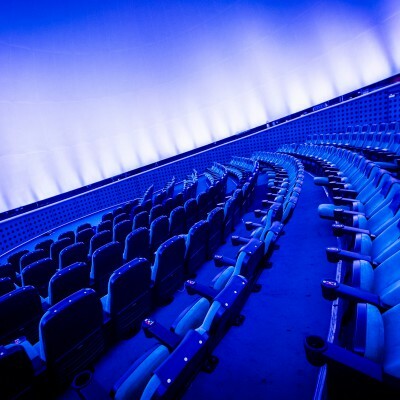 Geology has been the tool that has helped decode the Moon’s mysteries, using information trapped inside rocks like the one on display at the National Space Centre. Is our Moon Rock as beautiful as a diamond? Is geology boring? Can rocks be fun? All burning questions, and, although I don’t have all the answers, I do know that it is amazing that I can go to work and look close-up at a piece of the Moon. Two men collected it from a place 240,000 miles away out in space. 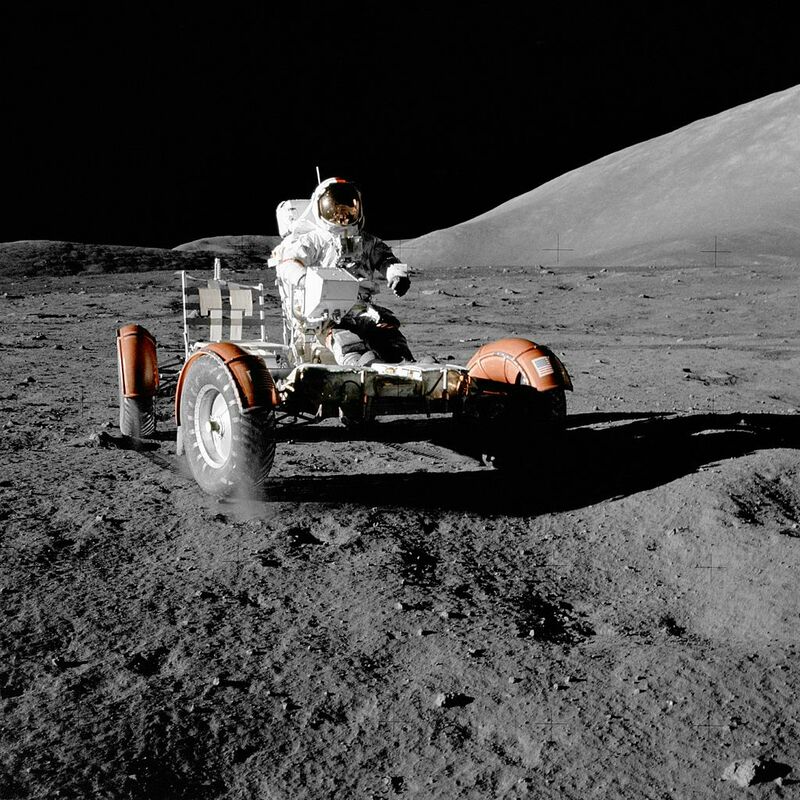 You can hear one of those men’s own recollections here, as Gene Cernan talks about collecting Moon Rock and why sending humans to explore space is so important. 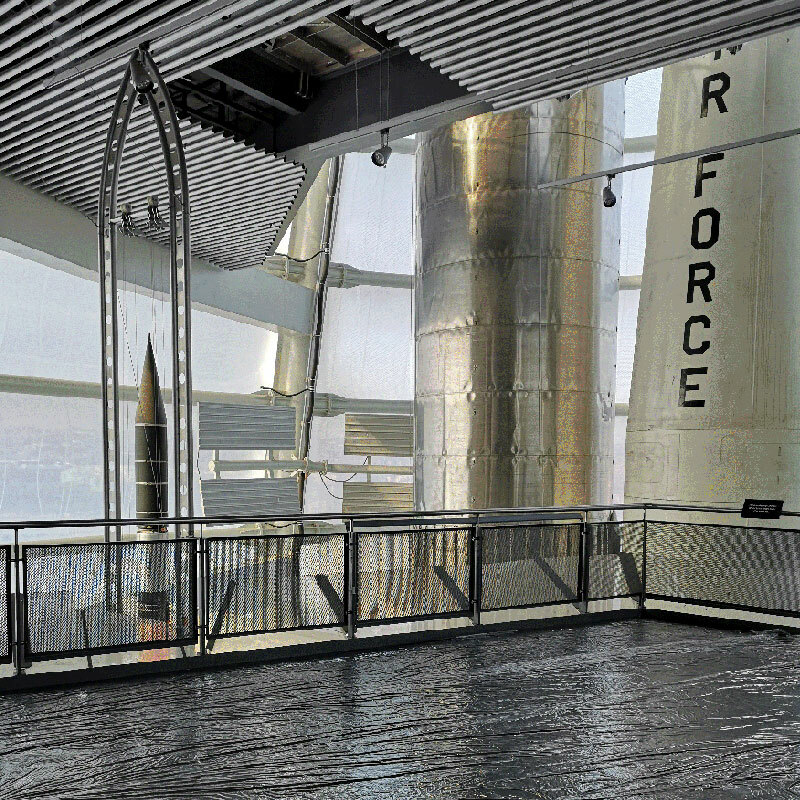 Our Moon Rock is displayed on Deck 4 of the Rocket Tower and is on loan from NASA.